The adverse effect of traffic on the comfort and safety of the residents in this area has the same root cause as in any other urban area, i.e. too many vehicles in too small a space. However, the problem is aggravated in Strathbungo in that the streets were not designed to carry through traffic or fast traffic, or to be used for parking. The older streets, Regent Park Square, Queen Square, Marywood Square and the northern half of Moray Place were built on a scale adequate for access to the houses by horse and carriage. The result is we have an area which is totally unsuitable for the unrestricted use of motor vehicles, whether belonging to residents or to anyone else. So said the Strathbungo Society in their fact finding report in 1972. 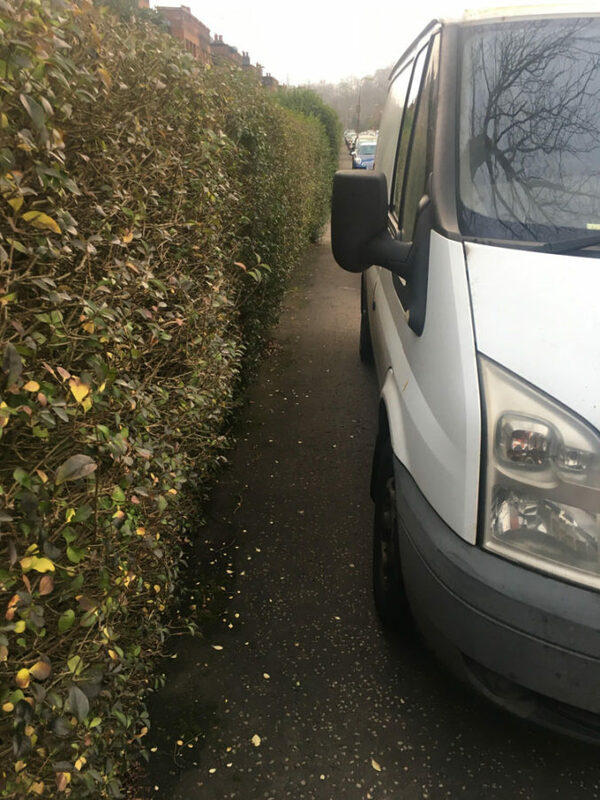 It’s a common theme in Strathbungo that the concerns of today are little different from those of yesterday, but it has been brought into focus by this week’s announcement of legislation to ban pavement parking in Scotland. What effect will this have on Strathbungo? Will we need to ask for an exemption, or is this the very thing we have been waiting for? 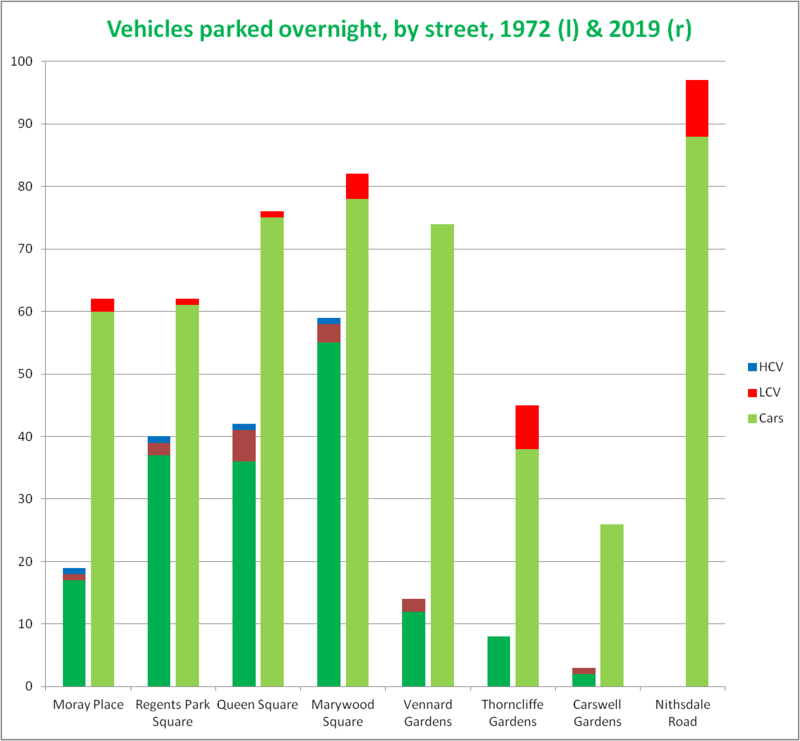 In 1972 the Society conducted a survey of the numbers of cars and commercial vehicles parked in Strathbungo overnight, There is nothing like hard data to base a discussion on, and so I couldn’t miss the opportunity to repeat it. This is what they, and I, found. The original survey was conducted in January 1972, early on a Sunday morning, when there was unlikely to be a significant number of visiting vehicles. The survey was repeated on a Sunday morning in January 2019, when additional attention was paid to the nature and legality of the parking. 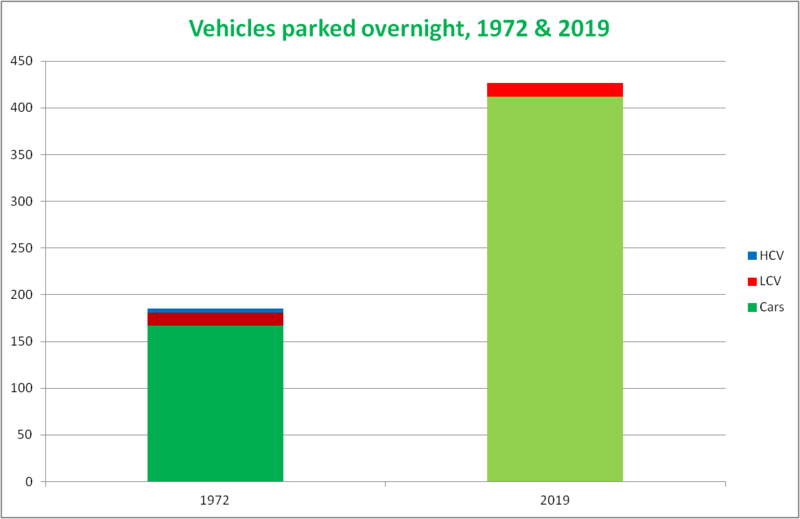 Vehicles parked overnight in Strathbungo’s Squares and Gardens, by vehicle type, 1972 & 2019. Nithsdale Road not included, as it was not surveyed in 1972. The number of vehicles parked in Strathbungo has increased 230% since 1972. On the other hand Strathbungo no longer has an issue with heavy goods vehicles being left in the neighbourhood. This was an issue in the 1970s probably because of the number of boarding houses then present, used by long distance lorry drivers. Changes in the number of vehicles in each street from 1972 to 2019. No data for Nithsdale Road for 1972. The same data broken down by street shows the Squares were already busy in the 1970s, possibly reflecting subdivision of houses; this was and is especially so in Marywood Square, where numbers were already high but have increased a little further. The squares have probably reached a maximum – there were very few remaining spaces in 2019. The biggest rise is in the gardens, presumably reflecting the increasing number of households with cars, and the increasing number per household. The number of light commercial vehicles (small vans, transit vans, etc) has changed little. Note also the streets were all two way until the 1990s, so presumably there was a need to leave some spaces in each street to allow cars to pass. The original survey did not review the standard of parking. While we generally accept the large number of vehicles, poor parking is a real issue for pedestrians, and occasionally those trapped at their front gate by a car. The frequency of parking on the pavement varies quite significantly. All parking on Nithsdale Road is in angled parking bays, and the pavements are wide and clear. In Moray Place parking is on one side only with room for vehicles to pass without parking on the pavement. The exception is outside 1-10, where the road is narrower, and almost all the pavement parking on Moray Place was recorded in that section. In Regent Park Square and Queen Square it is not an issue, despite the narrow roads. This appears to be due to the high kerb heights, which would risk damage to the vehicle. 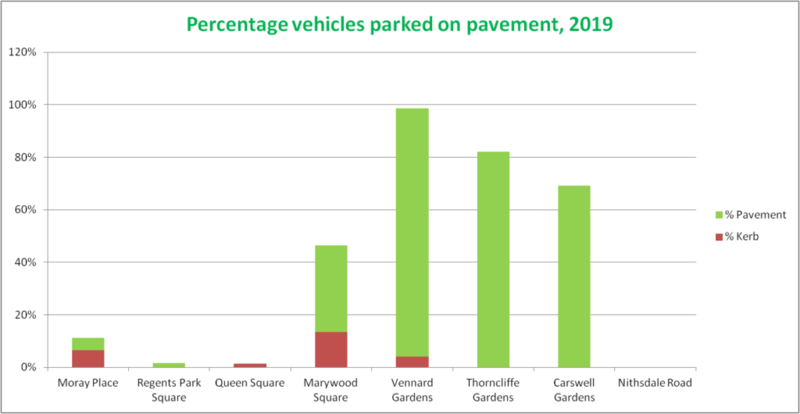 Marywood Square has the narrowest roadway, and the kerbs are lower, and fully 46% of vehicles were on the pavement, to varying degrees. 13% had their wheels on the kerbstones, while another 33% were on the pavement tarmac, and in all, 20% were obstructing the pavement to pedestrians. In the Gardens pavement parking is almost universal in Vennard, and the norm in Thorncliffe and Carswell Gardens, but the pavements are wider, with only three instances of obstruction (1%). Parking on double yellow lines is illegal, and in Strathbungo for good reason – they are painted on street corners where parking is dangerous for both cars and pedestrians due to poor sight lines. Notably many of these also obstructed the pavement itself, forcing pedestrians into the path of poorly sighted turning drivers. They were painted a few years back for this very reason, yet with no enforcement they serve little purpose. In Nithsdale Road the offenders were mostly parked in the marked turning spaces at each end of the street. Measuring pavement obstruction is difficult. The ideal is 1.5 m to allow two pedestrians with buggies to pass one another. 1 m is the minimum. Strathbungo’s pavements are narrow, and narrower still due to hedges, another issue. In Marywood Square the pavement is less than 1 m to start with! No pavement in the older part of Strathbungo meets the standard even in the absence of any vehicles, and anyone with a pushchair or wheelchair must use the roadway to make progress. I therefore used a much lesser standard; could a single able-bodied individual pass on the pavement without bumping vehicles or other obstructions, or contorting themselves to pass? This was possible in most locations, with just the occasional inconsiderately parked vehicle, but in Marywood Square there were 16 vehicles not even permitting this. This was most common at the Moray Place end, for no obvious reason. 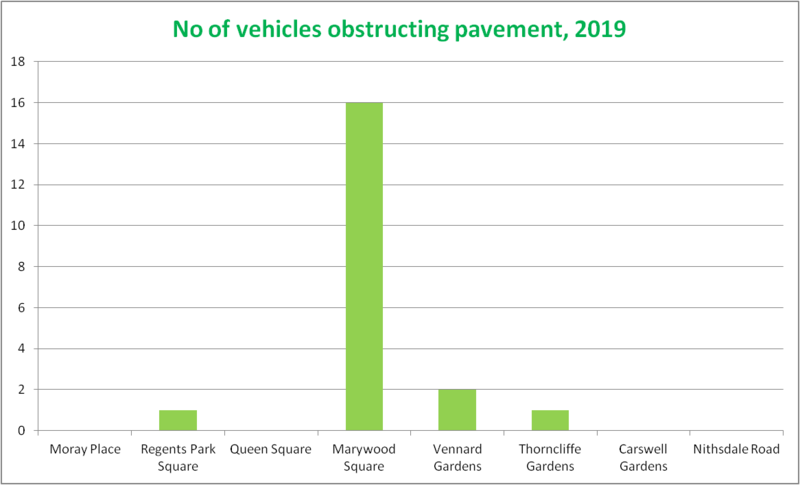 I was obstructed a further 6 times in Queens Square and Regent Park Square, but by hedges and other obstacles, not vehicles. There is no fundamental right in law to park a vehicle on a public road for extended periods, and it was frowned upon though not outlawed, until the 1960s. Roads are primarily for moving about. However parking in the road is an accepted part of modern life. There is a proposal to make pavement parking illegal in Scotland, but it is currently legal everywhere except London. Oddly it is illegal to drive on a pavement, which is how most of them get there, but this is largely ignored. It is however an offence to obstruct the pavement, and to park on double yellow lines. The Pedestrian Liberation website has the best summary of the law I have seen, though the law remains a mess. How much room is there? Pavements in the Squares are 90-110 cm wide maximum, but frequently much reduced by hedges. The roads vary, 610 cm in Marywood Square, 625 cm in Regent Park Square, 660 cm in Queen Square. In the Gardens the roads are 625 cm and the pavements 175 cm. In Moray Place the road is 525 cm, reducing to 410 cm at 1-10. The pavement is 120 cm. Cars have got bigger; using a Honda Civic and VW Golf as a guide, 20% longer and 15% wider than in 1974. A Golf is 1.8 m wide, a Range Rover Evoque 1.9 m, a transit van 2.0 m, excluding mirrors. A fire engine requires 3.7 m for access according to building regulations. No road is wide enough to meet this standard; each car would need to be at least 50 cm over the pavement to get close. In practice a typical fire engine is 2.55m wide, and would JUST fit down all roads except Marywood Square and 1-10 Moray Place With cars parked on the road (not pavement) on both sides, but would be blocked by one poorly parked car. Furthermore any car parked on the double yellow lines at junctions will prevent a fire engine turning into a street. There has been just such an occurrence this year, when the fire service could not reach a house fire due to poor parking. 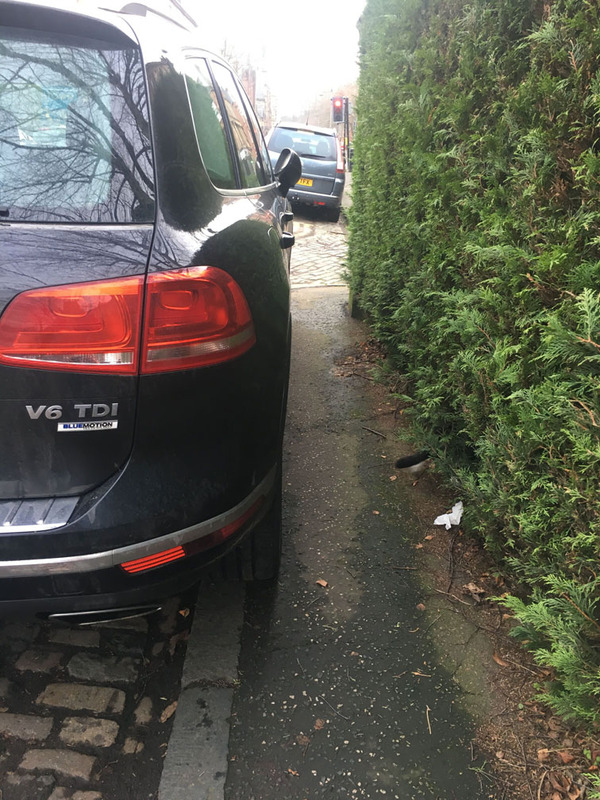 There is clearly a compromise to be had between the needs to preserve access for other cars (and emergency vehicles), and protect your car from damage, and that to preserve pavements, protect vulnerable pedestrians, especially the elderly or infirm, and those with buggies, prams or wheelchairs. How far you encroach on the pavement reflects your relative value judgements, I guess. In the Gardens parking partly on the pavement is the norm, and preserves a decent roadway without impeding pedestrians if done considerately, thanks to the wide pavements. In Moray Place there is no reason to park on the pavement, except at 1-10, but even here doing so forces pedestrians into the road, which is especially dangerous where vehicles turn in at speed from Nithsdale Road. In the Squares, high kerbs force vehicles to remain on the road, but the roadway is slightly wider. Hedges cause more obstruction than cars. 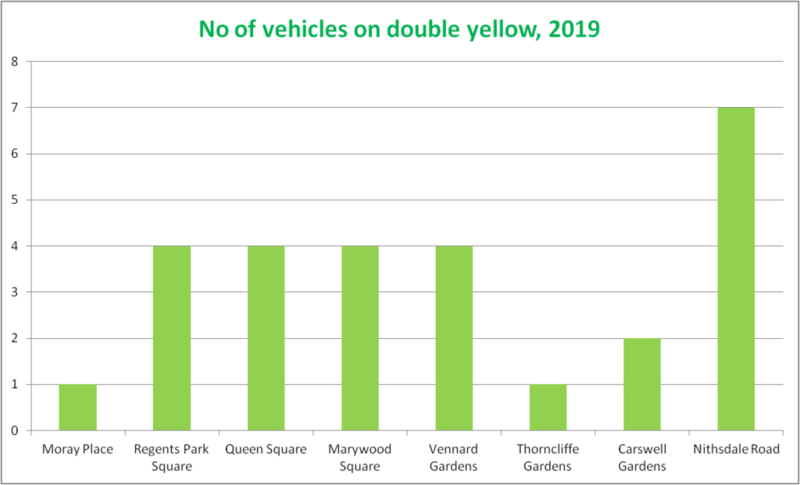 The exception is Marywood Square, which has the most vehicles, the narrowest pavements and the narrowest roadway, so it is no surprise the number of obstructions is highest. Most pedestrians don’t even bother using the pavements in this street, but walk in the roadway. Before we make any suggestions, we would like to hear what you think. Please leave us comments below, or on facebook. Would it be possible to re-pave the lanes to allow those with a garage at the back to park their cars there? Also, i notice the residents in the sandstone flats from Marywood to queens square, rarely use their back gardens. Might it be possible to use some of this ground for additional parking. Cars parking in a diagonal fashion, allowing more cars in. It would be reciting bin sheds, however this might work. People do park round the back already. There is a long history to resurfacing the lanes I won’t go into here, but the lanes belong to the residents, and the cost is high. I doubt anyone would give up their garden to someone else’s cars, and besides parking more cars round the back will not solve the problem, but just encourage higher car ownership – well, my opinion anyway. People in the flats own their gardens and I don’t think they would sell their outside space for others to park. Reduction of car ownership is the only solution. The area is well served with public transport so there is no excuse, except selfishness. Can I also say that most of the townhouses are now flat conversions and are now classed as tenement flats. We need to be discouraging such high car usage (not least because it’s terrible for the environment). We live in an area extremely well-served by public transport (my husband and I sold our car a few weeks after moving here and joined co-wheels for the few instances we need a car), so the amount of cars around boggles the mind. Parking on one side of the street, no pavement parking, and a one car per household limit (or a hefty surcharge for each additional vehicle) could all move the neighborhood in the right direction. There are plenty of places in the world where no parking spaces are included with a house/flat purchase—people either have to get rid of their vehicles, or live somewhere else. Seems perfectly reasonable to me. I have lived in Marywood Square since 1992. When the road was a two way street, passing was impossible, it involved one car having to reverse, and I often witnessed a Mexican standoff. Over the years parking problems have just snowballed. The original townhouses are mostly conversions and are now correctly classed as tenements. With three flats potentially having six or more cars and limited parking space outside each property this surely is the crux of the problem. I agree with HB, parking on one side only, no pavement parking and parking space limited to one car per household. If people don’t like it then move elsewhere where concern for the environment may not be so prevalent. Really interesting blog and very informative. I’d strongly support one car per household with fines implented for extras. The exception being if the residents can prove they need another vehicle e.g. for transporting people unable to walk. And parking on corners should be strongly penalised with fines. The revenue generated could be used to subsidise bike purchases! Imposing a 1 car per house won’t work for all. Some families need cars for work (I couldn’t work without mine!) Not sure what the answer is but agree we should apply the law already there as in can we get regular visits from traffic wardens to fine those on double yellows? It could absolutely work. People who can prove that they unequivocally *need* a car for work reasons could apply for an exemption (and it would all average out numbers wise, because I’d like to think plenty of people, like my husband and I have already done, would go carless). Some families need “cars” for work. What about car sharing? Okay, maybe someone would arrive at work a little early or leave later, so what, less selfish and kinder to environment. If your car is necessary for carrying out your work, fine, but if it’s just to get you from home to your place of employment then that’s not good. My previous employment involved 4 buses and 2 underground trips daily, something I undertook for 18 years despite having mobility difficulties. So there is no excuse other than a self-serving attitude.